Today I got to check off one of my bucket list items of heading to Yellowstone National Park. Ever since going to Yosemite about 8 years ago, I have wanted to visit as many national parks as I could. Obviously, Yellowstone was a huge draw to me. 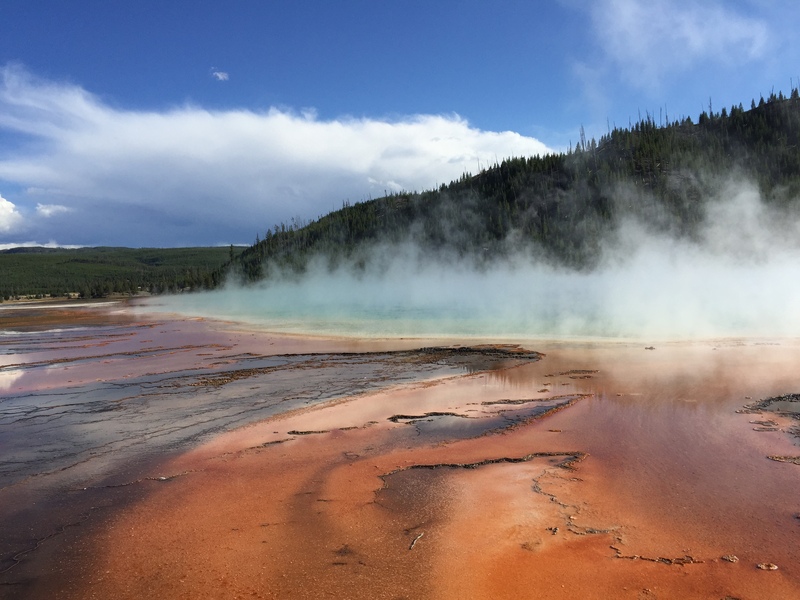 It’s the first national park, teeming with wildlife and geothermal features that just made it seem like an incredible place to experience. So finally being able to make it there was really something. 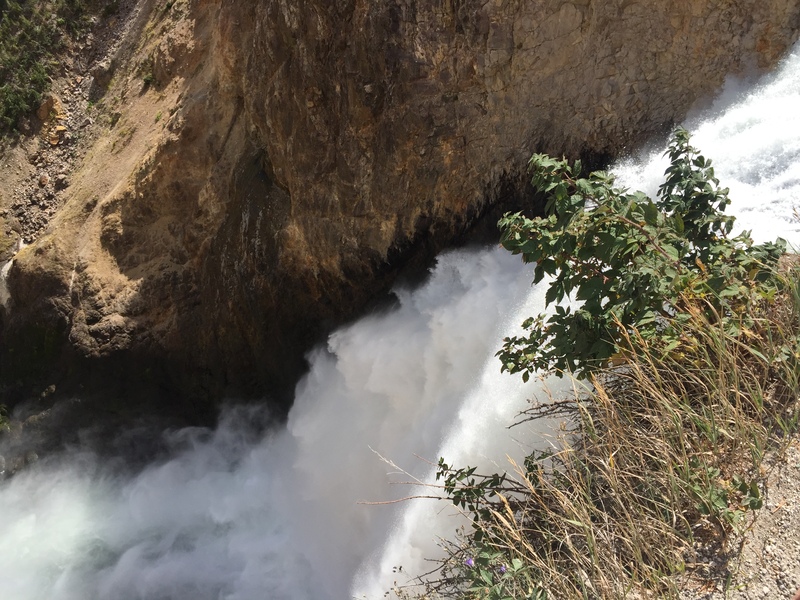 Yellowstone felt like a wild, strange place that was unlike anything else I have ever experienced. The range of scenery is really tough to grasp. In one day, I ran to the top of a mountain, hiked to the bottom of a canyon, stared into a sulfur spewing mudpot, watched Old Faithful erupt right on schedule, and then stared into the turquoise blue water of Prismatic springs. All in about 8 hours! Being a trail runner, and being on a running vacation, naturally I made the run the first thing on the agenda. With the race coming up in two days, I knew that if I were going to get a somewhat serious run in at the park, it would have to be today. Incredible views from the start of the Mt. 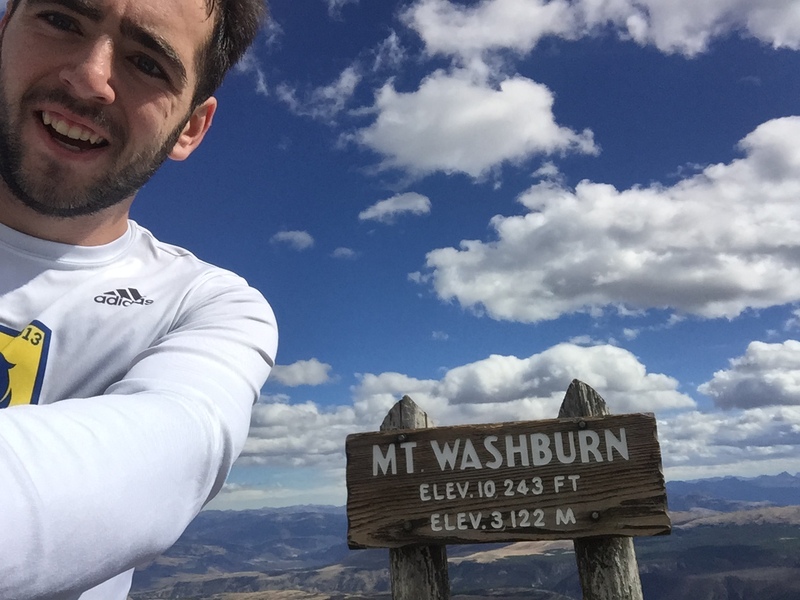 Washburn hike. I decided to run up Mt. Washburn. Sitting at 10243 feet, it seemed like a fun challenge and incredible way to look over the park. Also, the Mt. Washburn trail is my favorite type of trail – all up on the way out, all down on the way back. No need to constantly switch gears during the run and have to change pace constantly. 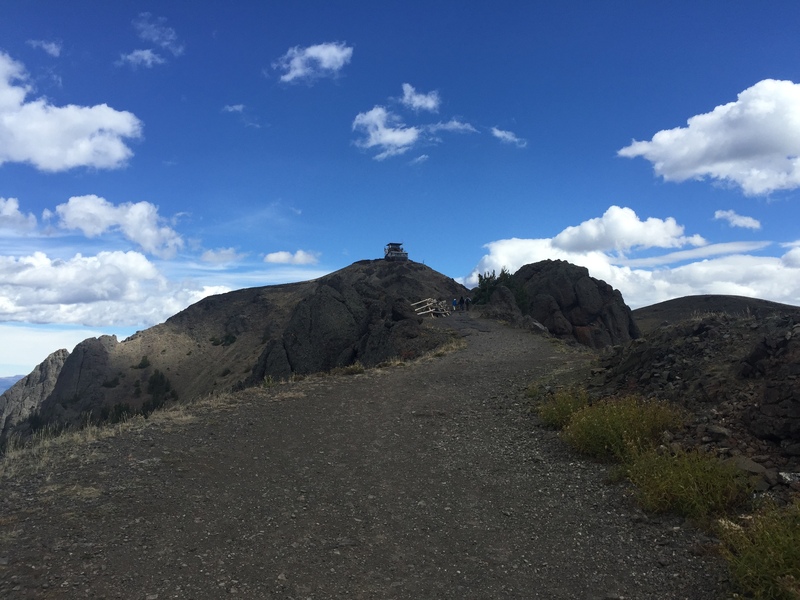 The trail is about 3.5 miles to the summit from the parking lot and gains around 1400 feet. The trail was paved at some point in time (although the pavement has since broken apart), so it is really smooth and easy running the entire time which made for a great run to start the day. The climb up piled on spectacular views. 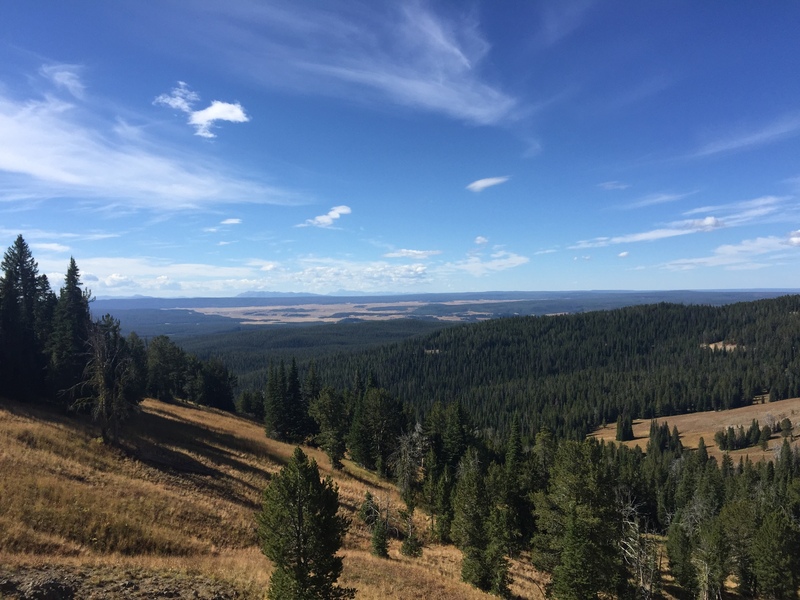 Only having my iPhone didn’t do any of the scenery justice, but on the clear day I could see as far south of the Tetons! 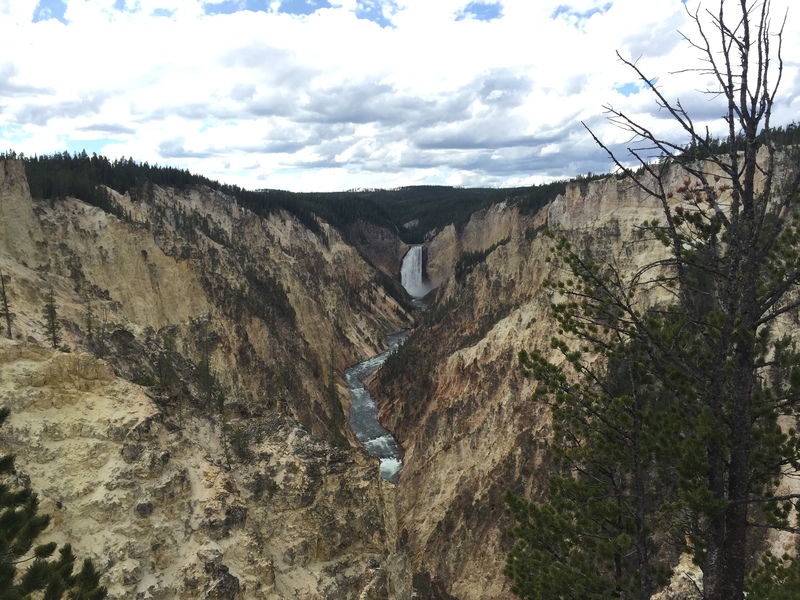 A bit closer was the gaping Grand Canyon of the Yellowstone plunging into the earth. The views were absolutely amazing and also made for a great excuse to stop every half mile or so to catch my breath. I am still not entirely adjusted to the altitude! Getting higher up on Mt. Washburn trail! With about a mile left on the trail, you start to approach the summit head-on. A small observation tower/hut sits on the top and acts as a nice reminder of how close you are getting. Another reminder was how windy the hike was getting. It reminded me of my run Memorial day weekend up Mt. Mansfield where I also felt like I was going to take flight. After 45 or so minutes, I made it to the top and snapped a quick photo before sprinting down to the trailhead. Made some friends on the way down the trail. 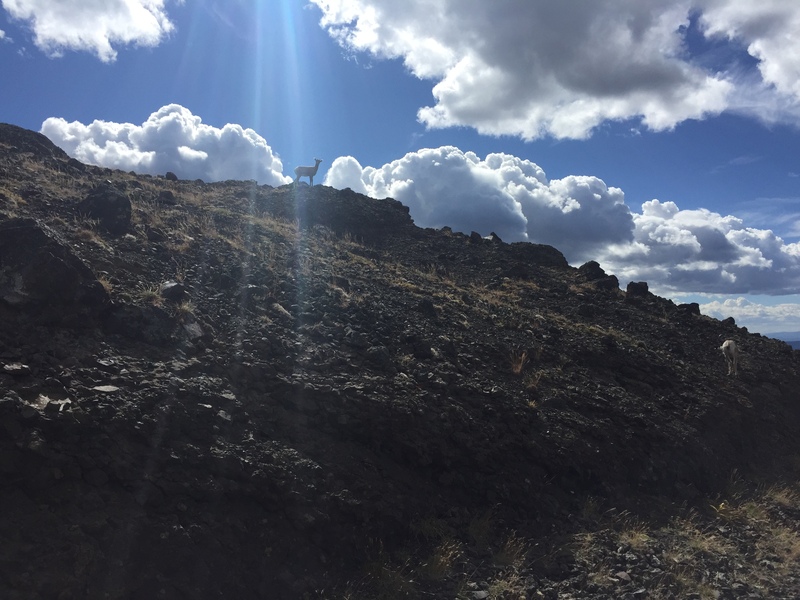 About half a mile down the trail I ran into some mountain goats hanging out just off the side of the trail. I took some time to see if they would make any fuss about my presence, but they seemed content and I moseyed past. A 3.5 mile downhill run on smooth trail was a blast and I felt like I was flying! I made it back to my car for a round trip time of about 1:15 and a total distance of 7 miles. Not a bad way to start the day! The run was really a great way to get familiar with the park, and the views were unmatched from the summit. 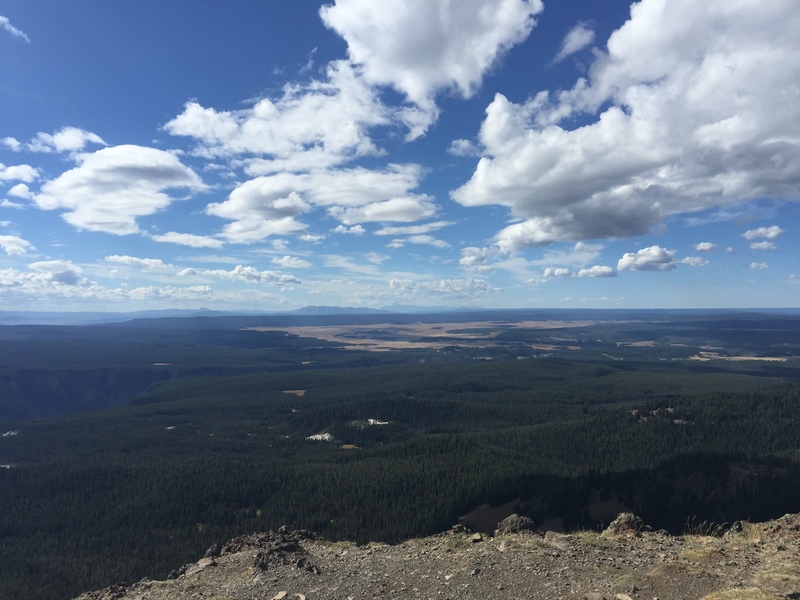 After looking at the canyon from the peak, I decided that the next part of my day would be checking out the amazing Grand Canyon of the Yellowstone. The canyon is one of those places that photos just don’t do justice. It really is huge, and the hues of colors causedby the volcanic activity are something else. I stopped at the north rim and checked out the upper and lower falls via a hiking trail that made its way along the rim. From there, I drove around to Artist Point which was one of the most astounding sights I have ever seen. Amazing views from Artist Point! After the canyon, I made my way around the park. I checked out Sulfur Cauldron and the Mud Volcano area which were essentially straight out of a sci-fi movie, spewing steam, mud, and a wretched sulfurous smell. I continued my drive south past Yellowstone Lake and decided to check out Old Faithful. I arrived to the touristy spot with about an hour before the geyser was predicted to erupt, so I got some well-deserved ice cream and peeked inside the incredible Old Faithful Lodge. Under different circumstances, I would definitely be staying there! After killing some time, I made my way to the viewing area and watched the geyser spew steam and water high into the air. Even with the crowds, it really was something amazing to see in person! I ended the day by going over to Prismatic springs, so named from the stunning colors caused by minerals, microorganisms, and sediment. I took a short stroll to the springs and was once again wowed by how stunning and surreal the place was. With that, I left back for Bozeman with plans to head back on Monday!